The organ, in its current configuration, is based on a two-manual instrument by Wadsworth of Manchester for the old mission church of St. Mark which stood in what is now Sackville Street. The original organ, built around 1890, was moved to the present church building in 1915. Shortly after the Second World War the detached console was installed and a complete rebuild which included the addition of a Choir Organ, was undertaken by John Oakes and Son of Meir Heath. 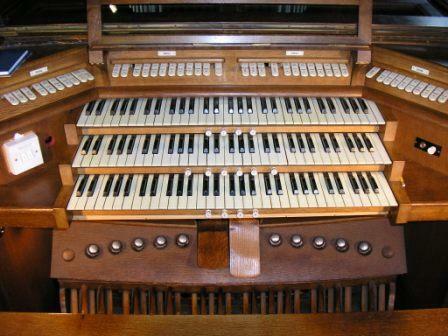 The resultant three-manual instrument we have today utilises some parts of the original organ. The rebuilding also saw the addition of the Great Large Open Diapason and Swell Trumpet ranks. These additions to the pipework transformed the organ’s character, adding considerable weight, vigour and variety. Further modifications by Hill, Norman and Beard in 1967 saw the introduction of new electronic coupler and piston systems. The casework was modified in 1949 and is dedicated to the fallen of the parish of the Second World War. The organ is used weekly for congregational and choral accompaniment and remains relatively reliable. Bracketed letters denotes shared ranks.